Change is in the air as three rounds of rain serve as the appetizer to the coldest air of the season so far. Oh, I am so not a fan of this forecast. 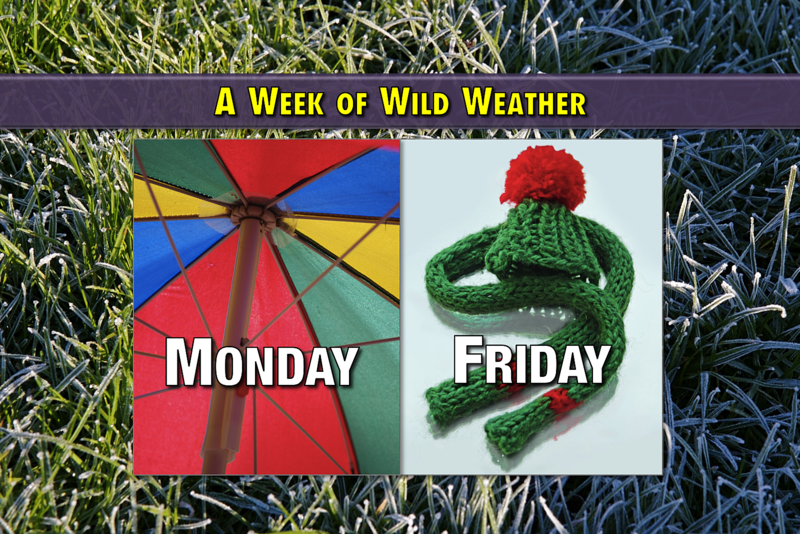 Wild swings in temperatures, three days-in-a-row of rain, a few snowflakes, and then a blast of some very cold air. Get the umbrella ready. Get the winter coat ready. It's going to be a very busy week in the weather center! We're waking up Monday morning with mild temperatures, mostly in the lower 60s. That's already above the normal high temperatures for early November (58 to 60 degrees). 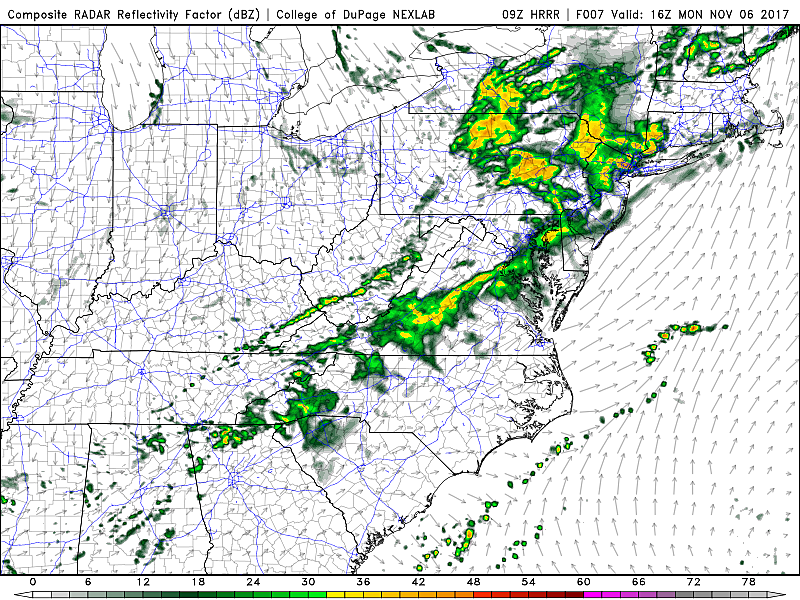 An approaching cold front will push a round of rain through the Garden State during the daytime hours Monday. As of this writing, the first raindrops are still well west of the Delaware River, just moving into Scranton, Pa.
After the rain comes the cold front, and behind the cold front comes our new, cooler air mass. Overnight lows will dip into the chilly lower 40s. And no more 60s and 70s — Tuesday's high temps will be limited to the lower to mid 50s. Despite a period of clearing skies early, your Election Day looks mostly cloudy, with another chance of showers in the afternoon and evening hours. The GFS model in particular limits that rainfall to the southern half of New Jersey, but I wouldn't rule anything out given overall model inconsistency. One more shortwave will provide one more chance of rain showers and extra clouds through Wednesday morning. I'm optimistic this round of light rain will exit fast enough to allow skies to clear partially by Wednesday afternoon. It's definitely going to be cool, with high temperatures only in the upper 40s to lower 50s. Thursday is clearly the weather winner of the week. As skies become mostly sunny, we'll enjoy seasonable (near-normal) high temperatures in the upper 50s to around 60 degrees. And then the bottom drops out on Friday, with the coldest air of the season so far (by far) arrives in New Jersey. The Friday morning low temperature forecast is uncertain at this point — there could be a frost or freeze, at least for North Jersey. High temperatures on Friday afternoon will be limited to the 40s, with very dry air and mostly sunny skies. It will be a bit breezy (sustained to 20 mph, gusts to 30 mph) which may force the wind chill ("feels like" or "apparent") temperature even lower. Saturday looks cold. Not cool. Not chilly. Downright COLD! The GFS in particular shows Saturday morning low temperatures in the teens in North Jersey, 20s through Central Jersey, and maybe above freezing in South Jersey. High temperatures will once again be limited to the 40s. As for which day (Friday or Saturday) will be colder? I'm not sure, given the model inconsistencies and the fairly extreme forecast. (Record lows may be in trouble.) I'm not going to be scared to change this forecast dramatically as the week presses on, based on forecast model evolution and analysis by my meteorological colleagues.